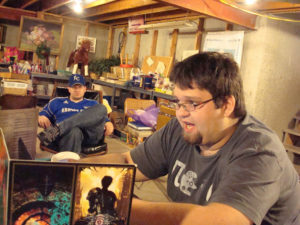 Welcome to the third part in a series about playing tabletop RPGs. The first post gave you some basic advice, while the second covered more advanced topics like improv. This post offers guidance on problems you may run into. Some DMs aren’t really running a role-playing game; they’re narrating their novel, within which the PCs happen to be characters. You’ll know this if the DM regularly denies or routes around reasonable character actions. In other words, if most of the things in the game happen no matter what the characters do, you’ve got an inflexible DM. Action: Talk to your DM. Describe specific situations in which you weren’t allowed to do something for plot reasons, and how frustrating that is for you. Note that the DM might not change. In that case, if you want to keep playing, ask the DM how you can make your character better fit the campaign. If you’re at an impasse, offer to DM yourself, or find another DM to play with. Some players dominate the game, insisting that everyone else follow their plan. Sometimes they’ll even move other players’ minis or insist that other players take specific actions. Action: To address this in game, use a clear word like “Stop” when they do it. Then explain, calmly and politely, that you appreciate their advice but you’re going to do whatever action you chose instead. If the controlling player complains, say “It’s my character, not your character,” and continue. Be upbeat, totally polite, and firm. If the controlling player continues, talk to him or her outside of the game. Describe their specific behaviors, and tell them that if they continue doing this, what you’ll do as a result (probably leave the game). Good news: This isn’t your problem! Some players are naturally more passive. For them, D&D night is a time to relax and clear out a dungeon; they don’t want to get deep into a character. Action: Let passive players be passive. Here’s all the advice in this series, combined into one place. Look for a class, race, and other options that interest you. A description of your character, in as much detail as possible. One family member, one knowledgeable friend to whom your character can go for information, and one influential acquaintance. Write down their names, classes, races, needs, fears, specific professions (guard, lord, dock worker, etc. ), and physical locations in the world. Ask for any unusual details about the setting, and for a list of house rules. Once you’ve created your character, memorize your character’s attack-related stats and passive Perception, and as much of the rest of your character’s abilities as possible. When you go to a face-to-face session, bring your character sheet, at least one pencil, extra paper, and snacks and/or drinks. If you’re hosting, clean. Show up on time. If you truly can’t make it, communicate that to everyone as early as possible. When the session starts, mute your phone. If the DM’s talking, be quiet and listen. If you can’t decide what your character would do, choose one course of action and just do it. If the entire group is inactive, do something reasonable, but do something. Choose courses of action that include other player-characters. When a player introduces a new fact, accept it and add to it. Don’t look at your phone. Between sessions, ask each other player what you can do to help their character achieve his or her goals. Write these down and have them with you during the game.